Ultra Culture Cinema: Mother – it’s so soon! We know Trash Humpers didn’t sell out but that was mainly because it was Trash Humpers. Mother is about 1000 times more likely to draw a crowd. 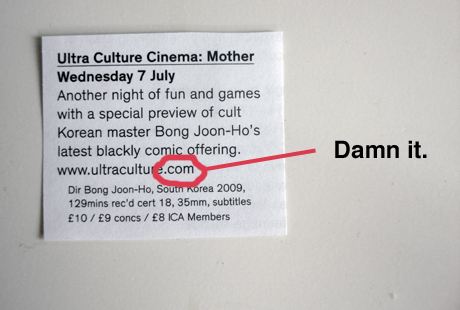 Tickets are still just £8 for Ultra Culture readers. Details here. Seriously, it makes me happy. We’re open to any and all suggestions. Get them in via e-mail or Twitter. See you on Wednesday, yo!